I have weird comfort food cravings. Sometimes it’s grilled sardines. Sometimes pasta with tuna and peas. Sometimes paella. What can I say, I’m a Portuguese gal (and Italian and Irish, so there’s lots of other cravings that go along with comfort). 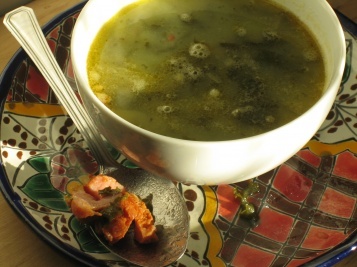 In the cold of winter, a favorite is Caldo Verde – Portuguese Kale Soup. My father’s from the Azorean island Sao Miguel, and I’ve been there many times in my 30 years. It’s so savory and creamy and hearty and spicy and just full of rainy/snowy day deliciousness. So I was thrilled when I realized how easy it is to make! Some potatoes, kale, butter, chorizo, maybe some leeks… brava! And it’s so easy that quantity and process are nothing to a bit of inspiration and flow. I lived in Cincinnati, Ohio last year for a performing gig and upon two visits home to Connecticut my father sent me packing back on the plane with chorizo, kale from the garden and hot pepper. What more perfect dish to make than caldo verde, no? Place shredded kale in a large soup pot and fill 3/4 of the way with water. Add about 2 teaspoons of salt. Peel and half potatoes and include in soup pot. Bring to a medium / high boil and cook until potatoes are soft, about 20 minutes. Remove potatoes from pot and place in large bowl, blender or food processor with a cup or two of the soup water. Add chorico to soup pot and turn down to low. Blend the potatoes and soup water (with hand mixer or other source) until very smooth. Add back into the soup pot progressively, mixing thoroughly until incorporated. Add more water if needed to thin the soup a bit. Add butter and olive oil, taste, and add more as desired. Serve with Portuguese rolls or toasted Italian bread and an awesome red table wine and you’re good to go! So I made this soup again the first week of 2010, when my father had sent me home some chorico after the holidays. This chorico was finer than the last, with a glorious dark-pink inside, less fat and thin casing. Longer than its previous brother, it had a tight, pungent sent, perfect for flavoring the caldo verde that my cold bones were craving! I varied the process of the recipe, and turned out the same great (albeit slightly pink in tone) soup! It made me realize the amazing flexibility of such a cuisine: because I didn’t want the fresh chorico my dad had sent to go bad, I used two long pieces instead of one. This, of course, made me need a bit more water and potatoes. Peel and cut about 8 small/medium white potatoes into quarters. Place in a large soup pot and fill with water until covered, add about 2 tsps salt. Boil until the potatoes are soft. When cooked thoroughly, remove about a third of the potatoes. Using a hand blender, blend the contents of the pot until the potatoes are thoroughly dissolved. If the broth is thin, add the rest of the potatoes progressively and blend. The consistency should be a little thinner than a pureed sweet potato or squash soup; not watery like a standard chicken or beef broth, but thin enough that the kale and chorico will be able to slide around comfortably. If too thick, simply add in warm water and stir until you get the desired consistency. If too thin (like my first attempt with this trial), simply add more potatoes and continue to a thickness you like. Slice the two chorico into disks about 1/4 inch thick, and add to the pot. Cook about 10 minutes on heat just high enough to keep it at a low boil. You should start to smell a gloriously rich scent wafting from the pot. Add the 1/2 bunch of shredded kale and cook until soft, about another 10-15 minutes. Drizzle in some olive oil and about 4 tablespoons of butter. Remember, as I learned quickly, this recipe is really adaptable. I don’t think any of my relatives ever had a recipe written down, and I never saw them measure a thing when cooking. Portuguese cooking should be full of tasting, reseasoning, and adding personal touches. Enjoy! yummmmmmm!!! i love kale. <3 (obs, i'd have to…umm, make a substitution, but it sounds amazing!) i love you, very very much. Yummy, can’t wait to try this one! Loving all the new ideas! Fantastic idea. I have just enough kale and potatoes left this week to give this a shot.